What Muscles Does a Rowing Machine Work and is it Effective? A lot of people ask about what muscles the rowing machine works, as they are trying to determine if it is an effective workout or if they are better off with a different piece of cardio equipment. Well, you'll be happy to learn that the rower is one of the most effective full body machines you can use, and it has many of the other others, including the treadmill and the elliptical, beat in several different areas. 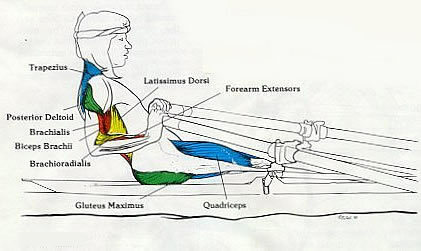 Depending on which phase of the rowing motion you are in: the catch, the drive, the finish or the recovery, there are different muscle groups being engaged. By the time you are done with a full stroke, you've hit just about every muscle in your body. In order to understand what muscles does a rowing machine work, it's important to know that, as we mentioned above, there are 4 different parts of the rowing stroke. At each stage your body is in a different position, and as such there are different muscles being engaged. Here is a brief explanation of each stage, followed by a breakdown of the particular muscles being worked. This is basically the starting position when you begin your workout. Your arms are fully extended and your hands are gripping the handles. The seat is all the way forward and your knees are bent into your chest. 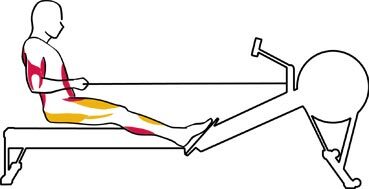 This is the thrust of the rowing workout, as you press against the foot pedals and drive yourself back, almost fully extending your legs. At the same time you are pulling your ams towards your chest forming a 90 degree angle with the monorail. At the end of the drive you have pulled the rowing arms completely towards your abdominal area and are past the 90 degree angle. This is where you extend your arms, lean forward and bend the legs, sliding forward on the rowing machine and returning to the catch position. From there the process starts all over again. Sure. 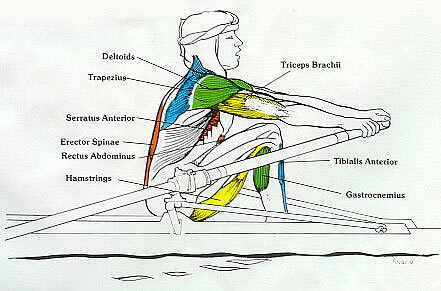 If you take a look at the different phases of rowing above, I'm sure you recognize at least some of the different muscles that are engaged in each phase. For example, in the initial Catch phase, you're working your tris, shoulders, traps, abs and hamstrings. In the Drive phase, there is a legs, body swing and arm pull through component, all of which target mostly different muscle groups. Here you have the shoulders, traps, quads, hammies, glutes, biceps and even the chest muscles. In the Finish stage you have the lats (side back) and forearms added to the mix. The Recovery stage adds the triceps again as well as the abs and wrist muscles. So Can You Build Muscle With a Rowing Machine? 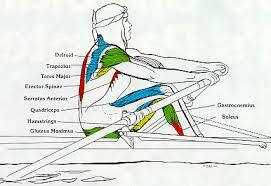 That's another question that is often asked along with what muscles does the rowing machine work. If you're talking about bodybuilding type muscles, with biceps bulging, huge quads and an enormous wingspan, then no the rowing machine workout will not give you that. However, if you've ever seen a professional rower, you'll know that those guys and gals are in incredible shape...long and lean with great definition in their arms, legs and abdominal areas. Looking at the chart above that's really no surprise, as all of these muscles are engaged with each stroke. Now imagine thousands upon thousands of those strokes. You can certainly tighten up muscles everywhere in the body, and burn a ton of calories to help enhance your definition. So the rowing machine provides a great workout...you can lose belly fat, they're good for the abs, biceps, triceps, shoulders, quads, hammies...every major muscle in your body and most of the minor ones will be put to work with each stroke of the machine. How Does the Muscle Targeting Compare to Other Machines? The rowing machine gives you a great all around workout, and definitely holds its own against other popular cardio machines. For example, it definitely gives you a better upper body workout than the treadmill, while putting much less stress on your knees and joints. It is comparable to an elliptical, as that machine also offers you an upper and lower body workout and less impact than the treadmill. 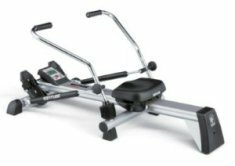 Just like with the treadmill, an indoor exercise bike does not give you an upper body workout either, so the rowing machine gets the edge in that regard too. So when it comes down to strictly muscles engaged, the rowing machine is definitely at or near the top of the list. It's a full body workout, and many of the smaller muscle groups that are engaged during your workout aren't being targeted even on an elliptical machine as the motion is very different. You may have noticed that many gyms now have added rowing machines as part of the group training workout, as they are recognizing the effectiveness of the workout they provide. Concept 2 Model D's and E's are found in health clubs around the world, and they can be linked together for competitions or for just tracking your performance over time. The growing popularity of rowing machines is a testament to their unparalleled ability to get you in great physical and cardiovascular shape, and the full body muscle targeting is an important element of that. 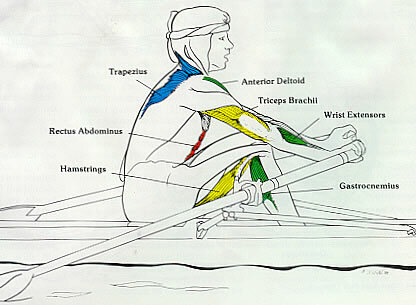 So next time someone asks you what muscles rowing targets, just tell them "All of them!"